This week’s post will be bullet point style, because I have lots to report, including a few videos and photos. I have increased my ROM (range of motion) to the brace limits today, which is 115 hip flexion (already on -10 or 20 deg. extension), which means I’m close to getting out of the brace. The only reason I am staying it is because of dysplasia and instability. The hip may be repaired but I am still ambulating on two structurally unstable hips. My stair climbing is getting stronger daily but I still don’t have enough muscle tone to independently stand on right leg, especially with the shallow socket. I took my first two yoga classes with a colleague this week. I focused on going at my own pace with a restorative and pelvic floor emphasis. I am honoring my many limits by practicing no full or end ROM (which I don’t have anyway), with a heavy internal focus on the yogic locks and TATD breath. I wore a long skirt today – without the brace, and felt comfortable and safe. I can touch my operative leg foot, with greater ease now! This seems small but is a big deal in order to take care of yourself and do things like get dressed, put on socks, shave your legs, even put on underwear and shoes! Although I cannot reliably stand on the right leg for long, I can do it for a very short time. I am reliably using 1 crutch indoors without pain – indoors and outdoors! See the videos below. In the meantime, PT is actively ongoing and I am just starting to ramp up activity and endurance. I am having trouble getting my gluteus medius (GMED, a major hip stabilizer) back online (see photo below), probably because it suffered major damage prior to surgery. The fibers were confirmed via MRA to be torn away from the iliac crest, and marrow changes showed injury to the bone. So, I have my work cut out for me. I have to take it easy and not move to fast to ditch crutches or walk independently. And, I certainly cannot lose my balance yet – which means not ditching the 1 crutch or progressing to a cane yet – because I don’t want to undo the surgery. Add functional Russian electrical stimulation (E-STIM) over the GMED during ambulation (walking) and in sidelying. This is successful, I can feel the GMED trying to come online (fire) with a stepping partial gait. This is great progress. And it is pain free. Add movement therapies (Medical Therapeutic Yoga based) to increase FABER (flexion, abduction, and external rotation) within healthy and safe limits. This was done without pain as well. Continue joint mobilization, soft tissue, and dry needling to increase hip flexion, which I did from 115 to 127. I could only get to 127 before the pain began. I added hip joint axial distraction at 90 degrees flexion with external rotation and oscillations at the end range, which successfully increased both FABER and flexion ROM. Continue Medical Therapeutic Yoga to improve functional mobility, decrease pain, decrease muscle spam and address adhesions and scarring, as well as myofascial and trigger points. Got into the tub successfully and safely for the first time! Able to FABER with right ankle resting above the knee at 45 degrees with trunk rotation at 60 degrees of flexion without impingement sign and leg pain. This is major progress. See photo in gallery below. Able to do cobbler’s pose (criss cross apple sauce) from the floor at 110 knee flexion and 30-40 degrees hip external rotation with 45 degrees of trunk extension without pain! Able to do pelvic clock in seated and in seated twists and four point pose without the quadratus lumborum going mad. It is still challenging the hip but it is improving! I can actively flex the hip without impingement pain for the first time in over 3 years! Making the slow and steady transition! Painfree increases of ROM are welcome! My littlest decorated my quad cane with love! He inspires me! ©2019. Ginger Garner. All rights reserved. Aim for no groin pain at the end of the day, which is a signal you have overdone activity or therapy. My floor to standing transfer is reliably pain free and easier now, since there is less risk of accidental torque/torsion or hitting the end of my available range of motion (ROM). Don’t force progressing your floor to standing transfer until you are emotionally and physically ready. Your PT can help you decide when it is time. Will I ever be painfree again? Will I ever get my ROM back? Will I ever be able to play with my sons on the beach again? To kick a soccer ball or run down the beach to catch a Frisbee? I didn’t let it get me down, because the PT side of me knew that this was transient, and that as long as I kept at it in physical therapy, in medical therapeutic yoga, in faith and hope, that I would rise. And I have. So be encouraged, you will get there too! Ginger has spent 20+ years helping people (mostly moms!) with chronic pain as a physical therapist, athletic trainer, and professional yoga therapist. 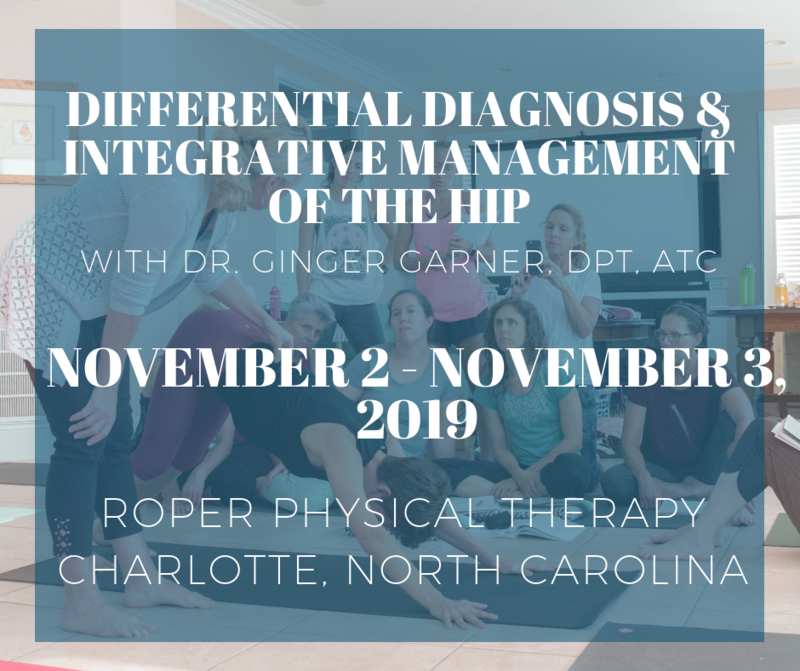 Ginger is the author of Medical Therapeutic Yoga, now in its 4th foreign translation, founder of ProYogaTherapy Institute, codirector of Living Well Yoga in Healthcare, and most recently ran for State Senate in NC.